Local knowledge is an amazing thing – at our Big lunch street party back in June we were privileged with a local secret – take-away pizza shop is ‘good for grills’. On Sunday, tired out after a long drive back from Norfolk involving hours stuck in the weekend traffic outside Cambridge we just had to grab a takeaway. You know the feeling when you just can’t face cooking and all you want is a decent plate of food? We decided to venture in. After skillfully avoiding her snobbery and getting the ‘pickiest foodie ever’ through the door we managed to order. A quick perusal of the fridge and the decision was made to go for the grilled meat rather than a pizza. The cheery chap at the counter made a bit of a gaff by asking the now ‘easily irritated’ foodie how she knew about merguez sausages! I was amazed that we didn’t suddenly bolt to the door but I think the fresh liver kebab was calling so we stayed and ordered. Options were negotiated – salad or chips, baguette or homemade bread – ‘irritated foodie ‘was so impressed that she declared this could be the start of a very beautiful friendship! 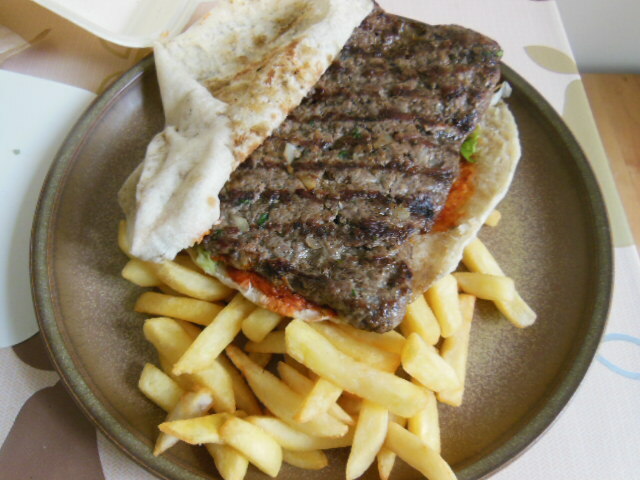 For £9 we had two large fresh pitta breads – made in front of your eye, one stuffed with three skewers of liver and one with a massive slice of kofta (seasoned minced lamb) cooked fresh on the grill, plus a portions of chips, a tomato, cucumber and feta salad, and two cans of diet coke! We were impressed – they tasted fab and were freshly made. The hot homemade pitta bread was a winner! You can eat in or take-away, there’s even a garden area at the back. They also do delivery and special offers on their pizzas. Next time ‘irritated’ foodie said she fancies trying the unusual ‘Algeriana’ – tomato, mozzarella, mincemeat & merguez sausage pizza! 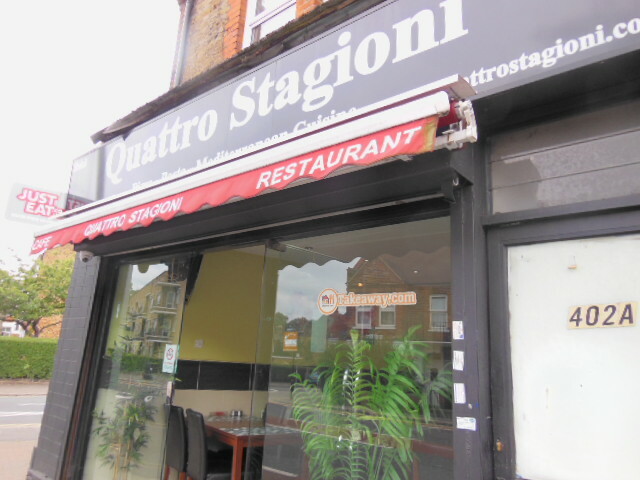 Pizza Quattro Stagioni – 402 Forest Road, E17 5JF (near William Morris museum) open midday until midnight. 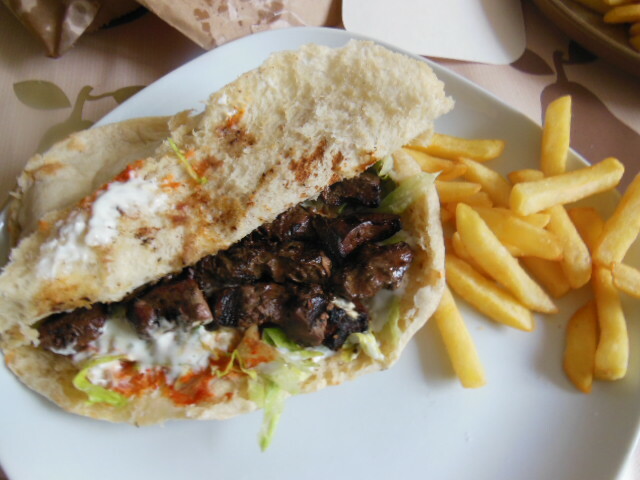 This entry was posted in Restaurants in E17, Takeaways and tagged cheap, e17, Forest Road, Kofte kebab, Liver kebab, pizza, Quattro stagioni, Take - away, Walthamstow. Bookmark the permalink. I’m kinda happy to read this. Marco and I tried there once for pizza, and were a bit disappointing. Maybe we should go back and give the meat a try! LOL! OH suggested getting their pizzas last night & your comments put me off! I now need to give them a go and try the pizzas! We got Indian takeout instead! absolutely – need to try their pizzas next! I GO HERE FOR MY MARGARITAS, BUT LASTIME LEFT ME WITH A SICKY TUMMY. 1 STAR. We have only tried the grills which we really enjoyed. Shame your pizza wasn’t a success.